Apologies for the this late post but, very frustratingly, I had to rewrite these words after two careless screen touches on my small Android tablet. 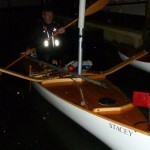 The two days at Shotley, staying in Steve’s home had been a welcome rest after five days sailing. The strong winds had moderated slowly and Saturday’s forecast was still a bit on the strong side but the wind was predicted to be from the South West so it seemed I’d be reasonably sheltered from waves as I sailed past the East facing coast. I considered a short dash out of the estuary of the rivers Stour and Orwell, 8 nautical miles up the coast to the entrance to the River Ore and from there, up the river to the small town of Aldeburgh which, 8 meandering miles upstream, is only 200 yards from the sea. It would then be possible, after an overnight at Aldeburgh, to drag Stacey across a shingle bank and back to the sea. 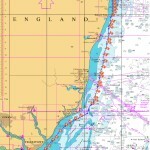 The alternative to this interesting and amphibious route was to take full advantage of the strong spring tide, running northward, and a fresh south westerly to take me some distance straight up the coast to Southwold or maybe even to Lowestoft, some 42 nautical miles away. I chose the latter and resolved to make up for lost time and get some miles under my belt. So, after a lunch of soup and Steve’s excellent homemade bread, Steve helped me pull Stacey back down the hill to the sailing club slipway where I launched around 2.30pm. 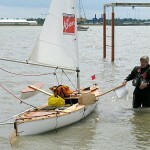 Steve said he admired my idea of what was an acceptable wind strength for a long sail in a small boat. I had my doubts but didn’t say so. The wind was still whistling through the trees and clanging halyards against masts as I set sail, with not a little trepidation. After around 5 hours of waves, wind and passing squalls I neared the port of Southwold, where I considered taking refuge, but I saw an opportunity to press on another 10 miles to Lowestoft before the tide turned against me. However, as the rush of the north going tide slackened the wind also started to die away and I wished I’d fixed the navigation light to the top of the mast as I neared the lights of Lowestoft in the increasing gloom. A large catamaran sailing on a parallel course came over so its crew could ask if I was okay. I attempted a cheery, but likely unconvincing, ‘yes I’m fine but thanks for asking’ response and gave them a wave as we parted company and they sailed on to Blakeney on the north Norfolk coast. 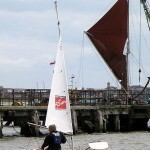 I’d also been in touch with Arthur from the Open Canoe Sailing Group, who’d provided much useful advice about the East Anglian coast, and I was glad Arthur and Greg would be at Lowestoft to meet me and help get Stacey out the water. Earlier in the day, there’d been a temporary exclusion zone around the port for an air show but this had ceased around four and a half hours before my arrival. However, just as I turned into the harbour in the darkness and heavy rain an enormous maroon went up followed by a huge explosion and then a further barrage of fireworks. I should have put back to sea and waited for the display, centred around the harbour entrance, to finish but, feeling exhausted, I sailed on directly underneath a series of further explosions shaking me and Stacey. I hoped not to be hit by any descending incendiaries or to be reprimanded for sailing through a firework display. Arthur, Greg, Gina and Eleri waved as I approached the inner harbour and I was soon up a steep green slippery slipway and on dry land. As we transferred kit to Arthur’s van, and with some justification, I was ticked off by the harbour master for entering the port against the two red lights I’d failed to spot under the fireworks, but I was cheered by the prospect of fish and chips followed by a comfortable bed at Arthur and Jenny’s home. Across the Forth – Take Two! 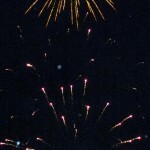 Blog produced and hosted by Single Blade © 2012. All Rights Reserved.